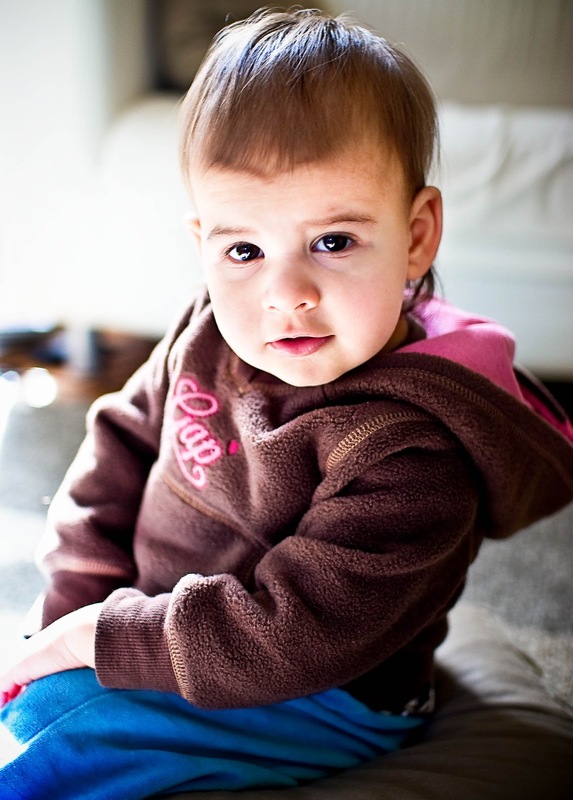 Veni, Vidi, Blogi: I Came, I Saw, I Blogged: Nissa At Eighteen Months. Yesterday, Nissa turned eighteen months old. EIGHTEEN MONTHS! Where oh where has the time gone? In this short period of time, my baby has grown and changed in so many ways. At a year and a half, pint-sized Nissa has the biggest personality of anyone in the household. She knows what she wants and she's not afraid to give you a piece of her mind if you don't give it to her. She is quick to laugh (I love that she still has her burbly baby laugh, even if she thinks she's a surly teenager) and also quick to get mad and throw things at you (a feat her older sister thankfully still hasn't figured out). She is starting to talk and jump, put on her own shoes, and her brain is making a thousand new connections each and every day. Which is probably why her sleep has gone to pot (yawn). Still, some things remain the same as always. Nissa still loves cuddles (when she dictates that the time is right) bananas, her blankie and above all else - her big sister. She simply adores Inara, in the most perfect and annoying way that only she knows how to express. Whatever Inara does, Nissa has to try to do as well. Where ever Inara is, Nissa has to be there. She wakes up saying her name and falls asleep doing the same. I never knew it would be like this - the constant bickering followed immediately by hugs and kisses. It's a total bipolar relationship - it's like the two of them can't stand to be together or to be apart. Never having had a sister, I have a feeling this is one of those mysteries that will always be beyond my ability to fully grasp, but it's as plain as day to see that they love each other - and that is enough for me. I hope that they will always have each other to love this way. With Nissa, everything is intense. She barrels around the house, speeding ahead at full tilt and takes any challenge on head-first (including leaping off the stairs. HEART ATTACK!). She learns by doing (in contrast to Inara - who would rather memorize an instruction manual), and she learns fast. She can already turn doorknobs, lift toilet seats, and she has an amazing aptitude for fine-motor skills (such as dunking washcloths into the toilet bowl and wringing them out so that they are the perfect consistency for sucking on. Blech.). She also has an uncanny ability to sense danger - and run towards it. Willingly. And with a maniacal glint in her eye. She also, apparently, feels no pain. As is evidenced by her nose - which looks like it just went through a cheese grater. When she skidded face-first on pavement at the playground yesterday she whimpered - and then tried to do it again. I fear for what the future has in store for all of us as she becomes better at hurling her body towards inanimate objects - like the GROUND. I think she might be a superhero. My sweet Nissa - I have loved you since you were just a speck in my tummy. You drive me to laughter and despair, to incredible joy and premature graying. You leave me speechless, astonished, and full of wonder every single day. The World According To Nissa is a magical, gravity-defying plaything, just waiting to be shaped to your liking. You are going to do amazing things here, baby girl. And we can't wait to come along for the ride. Happy Eighteen months, lovely Issie. Now please excuse me while I try stop you from breaking Daddy's laptop. Sigh.